Mama Dis is Pan: ‘Mr Ray’ delights. Virtuoso pannist and arranger Ray Holman showcased his well-honed skills in his recent concert series. The following report on the event was written by Gillian Moore and published in the Trinidad Guardian. Ray Holman’s recent concert series—Mama Dis Is Pan—staged at the Little Carib Theatre in Woodbrook February 23-25, was more than a presentation of the sweetness of the instrument; it was a showcase of a formidable body of work by the pan master, a nostalgic journey through his life in the steelband, and a celebration of pan hits through the years —all rendered in a style all his own. In his unassuming manner, the white-haired veteran took the stage before his band of musicians on opening night, to lead them on pan through two laid-back yet vibesy sets. 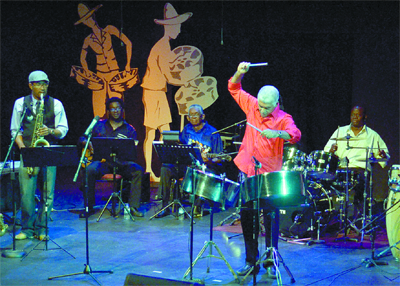 Unlike many steelband virtuosos, his playing was fully integrated with the band. Although he took several lovely solos, he never dominated the sound. The musicians— including Anthony Woodroffe sax; Dean Williams guitar; Brian Perkins percussion; Kenneth Clarke congas Joey Samuels drums; Mike Germaine bass; and, Dereck Cadogan keyboards—did well, keeping the sound smooth, without letting it get boring. Also on the cast were several vocalists, including De Alberto, in his first local performance in 20 years, Kenny J and Jerelle Forde. Holman got things going with his Pan On the Move, the first “pan tune” ever written. London-based De Alberto joined in for pleasing renditions of Pan Woman and Scrunter’s Woman on the Bass. His performance was well appreciated by the audience. Holman changed the pace with I’ll Always Love You (Taylor Dane), which he said was one of his favourite songs, before introducing young vocalist Jerelle Forde, whom he called “the best-kept secret in Trinidad.” She sang Oh Trinidad, the last of many songs on which Holman collaborated with the late Merchant. The band then did a Merchant medley, including Barataria Sweet (but Morne Diablo sweeter) and Taxi Driver. The opening bars of Steel Band Clash were enough for the audience to chime in with “A-ha!” Alternating between the mic and his spot behind his double drums, Holman sang the lyrics with the crowd joining him for the refrain: “Never me again to jump in a steelband in Port-of-Spain.” The pan ace recounted how as a youth in Woodbrook, he was mentored by pan pioneer Ellie Mannette at Invaders panyard. He said he recalled, in 1955, first hearing Manette play double seconds on the radio. He said it was “like something out of this world”. Sweetly, he played Melody’s Michael, a simple song harking back to those early days. A Sparrow medley was next, Holman hailing the Birdie, along with Kithchener as one of his great musical influences. The band did Rose, Memories, Congo Man, Jane and Melda. The second half offered more memorable gems, including a delightful arrangement of Pan in Harmony; Jerelle Forde with Carnival is For the Woman and a lively performance of Shadow’s I Come Out to Play; De Alberto doing My Band; Kitchener’s Margie and Iron Man; and Kenny J doing Plenty Loving and Baron’s Somebody, which was a big hit with the crowd. The band got whimsical with I Feel Pretty, giving it a nice calypso swing. They segued into Penny Lane to close the show. The audience rose to their feet to give Holman a rousing ovation, and the emotion in the room was palpable. He had delivered a show that was nostalgic and sweet, romantic and musical. The band performed a short classical piece as an encore, topping off a beautiful show. For the original report: Mama Dis is Pan: ‘Mr Ray’ delights with musical nostalgia | The Trinidad Guardian Newspaper. Trinidad Guardian’s New York Correspondent, Dr. Glenville Ashby, reports on the event held at the Trinidad Consulate New York offices to commemorate Black History month. Drummers ignite the large audience. The Trinidad and Tobago Consulate in New York was transformed into a virtual palais as members of the Orisa and Shouter faith, backed by drummers, ignited the packed audience. The occasion was Black History Month celebration, the first of its kind at the downtown Manhattan consular offices. In her opening remarks, consul General Rudrawatee Nan Ramgoolam stressed the importance of culture in the lives of people the world over. She lamented the cultural disconnect by many of the nation’s youths, and beckoned them to re-examine their rich cultural heritage and the people who have excelled in every field despite struggles and obstacles. “Too many of our youths are without positive mentors and even heroes and we feel that celebrating the great persons in our past and present will offer a point of reference,” she noted. 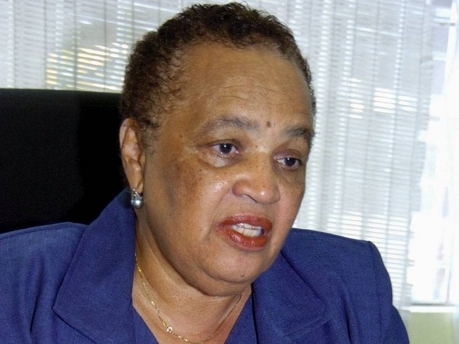 She identified the unparalleled contribution of Dr Eric Williams, ANR Robinson, CLR James, Rudolph Charles, Boscoe Holder, Len Boogsie Sharpe, Giselle La Ronde, Janelle Commissiong, Hasley Crawford and a host of others prominent Afro-Trinidadians. She also made mention of the distinctly Afro-centric faiths that make up the twin island’s religious mosaic, and the contribution of the community to the unique island cuisine. For the original report: T&T celebrates Black History Month in NY | The Trinidad Guardian Newspaper. The Caribbean is a fertile environment that fosters complex identities created through the fusion of cultures brought to the islands, identities that Caribbean peoples then take with them as they leave their nations and settle into new homes. The traditions transmitted within these communities are continually subject to loss, gain and reinterpretation. Communication practices play a role in this process as they help to maintain, express, transfer, and challenge the diasporic identities of Caribbean. “Re-Constructing Place and Space: Media, Culture, Discourse and the Constitution of a Caribbean Diaspora” examines the role of cultural performances and mediated expressions in the construction and maintenance of Caribbean diasporic identities. The objectives for the book are two-fold. The general objective is to contribute to discourse on diasporic identity and performativity. The more specific aim of the book is to highlight the diversity and complexity of Caribbean people’s production of and engagement with cultural forms. Though much work has been done to debunk the exoticized images of Caribbean nations, people from these countries are often perceived as an essentialized, undifferentiated category, and as technologically and intellectually backward, incapable of sophisticated cultural production, interaction and interpretation. “Re-Constructing Place and Space: Media, Culture, Discourse And the Constitution of a Caribbean Diaspora” seeks to present a more complex representation of people in the Caribbean diaspora, one that highlights their complicated and dynamic relationship to mediated material. The volume emerged from the 2009 New Media and the Global Diaspora Symposium: Exploring Media in Caribbean Diasporas held at Roger Williams University. The event sought to encourage academic discourse focused on Caribbean migratory populations, foregrounding the role of communicative practices in transmitting and sustaining their traditions. It was also designed as an interdisciplinary forum for Caribbean researchers who study the nature, significance and consequence of Caribbean migration. In keeping with the spirit of the symposium then, this volume applies a transdisciplinary lens to understanding the diversity and complexity of peoples from the Caribbean region and their diasporic communities. KAMILLE GENTLES-PEART (PH.D.) is Assistant Professor of Global Communication at Roger Williams University. She received a B.A. in Mass Communication, with a focus on multicultural journalism, from Lehman College of the City University of New York, and holds a Ph.D. in Communication from the University of Michigan, Ann Arbor. Her general research interests include the relationship between diasporic identity construction, particularly of West Indian women in the U.S., and media engagement. MAURICE L. HALL (PH.D.) is Chair and Associate Professor in the Communication Department at Villanova University, Pennsylvania where he teaches courses on communication in organizations, research methods, and organizational research and consulting. Dr. Hall has also worked as a consultant with a variety of organizations over the past ten years. He specializes in facilitating strategic planning sessions for non-profit organizations, and working with organizations on issues ranging from diversity training and strategic diversity management to conflict management, team building, and organizational communication management. “John Gray, master bibliographer of the Afro-Atlantic world has done it again. His powerful new work, Afro-Cuban Music: A Bibliographic Guide, covers the subject in all its facets, all its glory. I wandered happily through this wondrous text, learning, learning, learning. Gray makes you aware of what an amazing cultural machine black Cuba is, from the habanera to orisha rap and back again. A landmark publication in Black Studies. Despite its relatively small size Cuba has had an inordinately large musical influence both inside the Caribbean and abroad. From the “rhumba” craze of the 1920s and ’30s to mambo and cha-cha-cha in the 1950s and ’60s and the Buena Vista Social Club phenomenon of the late ’90s, Cuba has been central to popular music developments in Latin America, Europe, and the United States. Unfortunately, no one has ever attempted to survey the extensive literature on the island’s music, in particular the vernacular contributions of its Afro-Cuban population. This unprecedented bibliographic guide, the third in ADP’s critically acclaimed Black Music Reference Series, attempts to do just that. Ranging from the 19th century to early 2009 Afro-Cuban Music offers almost 5000 annotated entries on the island’s various festival and Carnival traditions as well as each of its main musical families-Cancion Cubana, Danzon, Jazz, Son, Rumba, and Sacred Musics (Santeria, Palo, Abakua, and Arara)-along with more recent developments such as timba, rap and regueton. It also provides sections on Afro-Cuban musical instruments, the music’s influence abroad, and a biographical and critical component covering the lives and careers of some 800 individual artists and ensembles. Spanish-language sources are covered comprehensively, in particular dozens of locally published journals, along with a sizable cross-section of the international literature in English, French, German, and other European languages. The work concludes with an extensive reference section offering lists of Sources Consulted, a guide to relevant Libraries and Archives, an appendix listing artists and individuals by idiom/occupation, and separate Author and Subject indexes. An essential tool for students, scholars and librarians seeking a window into Afro-Cuban expressive culture-its music and dance, religion, language, literature, aesthetics, and more-both on the island and abroad. The author is veteran bibliographer John Gray whose previous works include Blacks in Classical Music, African Music, Fire Music: a bibliography of the New Jazz, 1959-1990, From Vodou to Zouk, and, Jamaican Popular Music. To order please visit the ADP website: www.african-diaspora-press.com<http://www.african-diaspora-press.com/>. The book is also available through most library wholesalers. Afro-Cuban Music: A Bibliographic Guide is an impressive accomplishment that will prove an invaluable resource for researchers. It is well-organized and offers comprehensive coverage of the available literature, particularly periodical sources which would otherwise be very difficult to find. Users will also appreciate the many annotations included for the details they provide on each work’s contents. Marcia Rowe, Jamaica Gleaner writer, reports on the observation of the 50th anniversary of the Jamaica’s National Dance Theatre Company. In 1961, at the invitation of Norman Manley, 18 leading dancers from different dance schools were thrown together to form the Jamaica Dance Company. They had no repertoire. The following year, 1962, under the same name, they danced at Jamaica’s Independence celebration. But, in September of that year, all the dancers left the original schools that they were part of; and decided to establish themselves as the National Dance Theatre Company (NDTC). Fast forward 50 years later with an extensive repertoire, many international tours, a studio of their own, a feeder school, many new faces, the NDTC celebrates its 50th year of existence. “None among them [the founding members] could have predicted that the company would have accomplished all that it has,” said Barry Moncriefe, NDTC artistic director, at the Company’s 50th anniversary launch last Thursday. 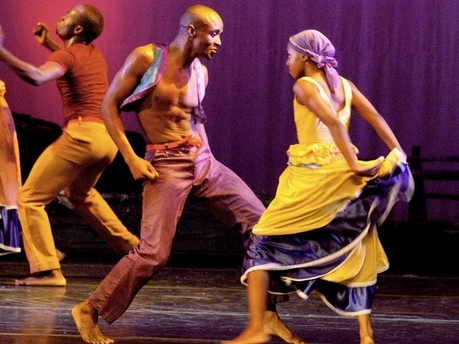 “The company has managed to sustain interest in and support for Jamaican dance theatre over five decades, and is revered as one of Jamaica’s most loved cultural treasures. It is for this reason that we remain resolute to our vision to forge out of the Jamaican and Caribbean culture and life, an art form faithful to reality while being a part of a wider world and universal landscape of the creative arts,” continued the longstanding company member. “The LTM and NDTC relationship speaks for itself, we need each other,” she said, before continuing to creatively embroider her personal experiences with the NDTC into her speech. She recounted her first overseas tour with NDTC to Canada as a young journalist at The Gleaner. “The first tour was a birth of what happened after – to travel the world.” There were to be numerous adventures along the way including a “nice time in Atlanta”. With the dance floor of the NDTC studio as the stage, the delightful evening’s programme flowed with a message from the chairman of the Rex Nettleford Foundation, Carlton Davis, a vote of thanks from NDTC Musical Director, Marjorie Whylie, and excerpts from the company’s’ repertoire. The dances were performed by the now generation of dancers. The dances ranged from works from the young choreographer to the old, from the classic to the contemporary. The entertainment package danced off with Oneil Pryce-choreographed Barre Talk. It was followed by Clive Thompson’s Phases of the Moon. Sandwiched between two of Netleford’s works, The Crossing and Odyssey, was a lovely presentation from the NDTC Singers. Some time later, after the formalities, The Gleaner caught up with one of the seven living, founding members of NDTC, Bert Rose. He described the journey of the company as wonderful. 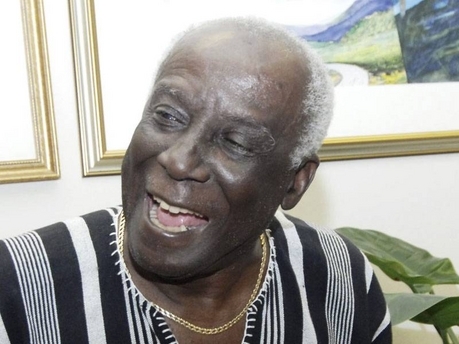 “Nettleford had a vision. When we started, we never knew that we would have celebrated 50 years. Only seven of us are still alive out of 18,” said Rose. “Eddy Thomas’ first choreography was called Legendary Lovers Leap, and Rex did a piece called Plantation Revelry,” Rose said, of the beginnings of the company. Rose also went on to explain some of the challenges of development the company faced. “We swept the stage, we painted the backdrop, ironed our clothes, ran box office,” Rose said. As the company developed, they got someone to wash the costumes and hired a costume mistress. Other noted changes over the years are the shift in the choice of musical genre and the incorporation of international choreographers like Cuban-born Edwardo Rivero Walker. Davis was the MC for the evening. Just a couple weeks into the position, he explained that one of his reasons for accepting the post was his belief that this sort of cultural organisation should be supported. It represents the best of Jamaica. And what is to be expected under his stewardship? The year-long NDTC 50th anniversary celebration will continue with the usual calendar events as well as some new ones. The evening was also used to launch the NDTC website. For original report: NDTC begins celebration of its 50th – Entertainment – Jamaica Gleaner – Tuesday | February 7, 2012. 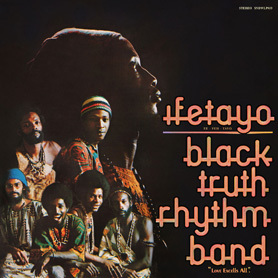 David Lewis reviews the release of Ifetayo album of the 1970s Trinidadian musical aggregation, Black Truth Rhythm Band, for Black Grooves. Soundway Records, a label that is invested in re-releasing vintage music from the Global South, has found a gem in this 1976 album that, at the time, made very little impact. The Black Truth Rhythm Band, an Afro-centric Trinidadian group, was formed in 1971 but made only one recording before disbanding, though Oluko Imo?the band leader who plays multiple instruments here?went on to record with Fela Kuti. The band formed and released Ifetayo in the midst of the Black Power Movement in Trinidad and, along with performers like Lancelot Layne and Cheryl Byron, responded to the African-centered vibe of the movement in their music, making liberal use of African-style drumming and instruments like the mbira. The album is not simply an African fusion album, though; the band skillfully weaves music from many traditions through a soul and funk-tinged set of tracks. The title track, “Ifetayo,” is deliciously funky and falls into a drum and flute break that sounds decidedly West African. “Kilimanjaro” ends with an up-tempo Latin American guitar break. The band also incorporates steelpan, the national instrument of Trinidad, as an integral part of the group (not simply a flourish to pander to tourists) in “Save D Musician” and “Umbala.” Further emphasizing their Trinidadian roots, “Aspire” is a decidedly funked-up calypso beat, and “Save D Musician” has a calypso-like shuffle and lyrics that address social issues, like any good calypso song. Since this album is a re-issue, listeners have to be invested in the early 1970s sound, but if you are, it’s a strong album that deserved much more attention than it received initially. The album also pre-figured a number of developments in Trinidadian music, including the African-influenced music of rapso artists like Brother Resistance and 3canal, and the current Trinidad-based world fusion band Terrenaisance. Ifetayo is currently available from Soundway in three formats: an MP3 download and CD, both of which contain a bonus track, or, for purists, an LP with a 7” disc containing the bonus track. For the original post: Ifetayo | blackgrooves.org.